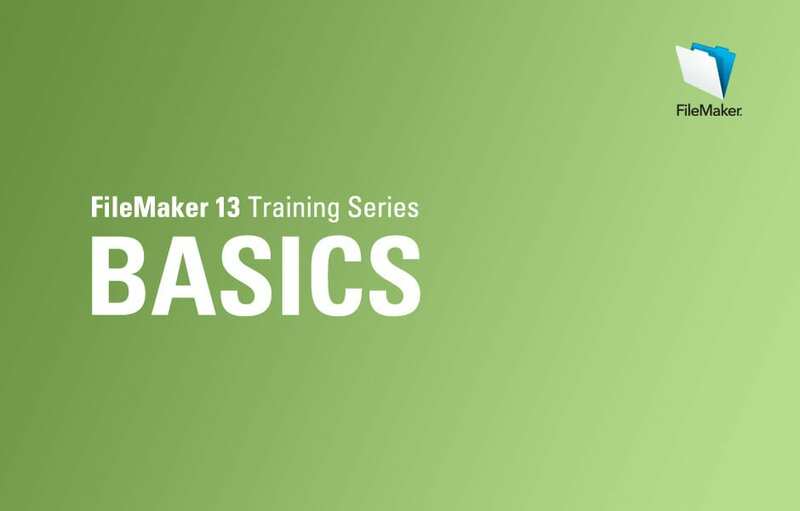 New FileMaker 13 Training Series: Basics . FTS Basics is an add-on to the Getting Started Tours and will serve as an introduction on how you can use the FileMaker Platform to create and deploy custom data management solutions. The Getting Started Tours and FileMaker Training Series: Basics are available immediately at no charge. Follow the links below to download a copy today. You will learn the fundamentals of FileMaker and the skills needed to build professional custom business solutions that run on iPad, iPhone, Windows, Mac and the web. The new training series is offered in iBook format for easy use on iPads and iPhones. A PDF version is also available. FileMaker Training Series: Basics, includes an iBook and activity files, which provide step-by-step hands-on instruction. Click here for a free download or visit the iBooks Store. The Getting Started Tours are built into FileMaker 13 and are a great first step. The tours are automatically installed with the software -- simply download a trial of FileMaker Pro 13 or download FileMaker Go 13 for iPhone or iPad from the App Store. IT Solutions will be offering intermediate and advanced FM13 trainings courses this spring. Stay tuned for the course dates, registration announcement and early bird discount rates. If you have any questions about our training programs, or if you’re interested in upgrading your existing system to FileMaker 13 upgrade, contact us today. FileMaker, Inc. is offering an all-new free training series, FileMaker Training Series (FTS): Basics, for the recently announced FileMaker 13 Platform. FTS Basics is an add-on to the Getting Started Tours and will serve as an introduction on how you can use the FileMaker Platform to create and deploy custom data management solutions. The Getting Started Tours and FileMaker Training Series: Basics are available immediately at no charge. Follow the links below to download a copy today.